I find that fax is often misunderstood, especially when it comes to way it works on VoIP networks. Also, I’ve noticed that there is very little information on the internet about how to deploy fax on Lync. In my years working with VoIP, I have run into many fax issues on many different platforms. So I thought I might write an article that explains exactly how Lync does, and doesn’t, support fax. This article is not designed to be a walk-through of how to configure fax on your specific gateway, but instead to provide you with information that will help you troubleshoot your own fax problems in the future. After all; "If you give a man a fish you feed him for a day. If you teach a man to fish you feed him for a lifetime." T.30 – Is an ITU recommendation that describes procedures for sending faxes over the PSTN (via modem tones). These include: call establishment and call release; compatibility checking, status and control command; checking and supervision of line conditions; control functions and facsimile operator recall. If you would like to read the spec you can download it here. V.34 (and other V.x protocols) – The V protocols describe the modulation and demodulation (modem) techniques used to pass data (in our case, fax) over a phone line. 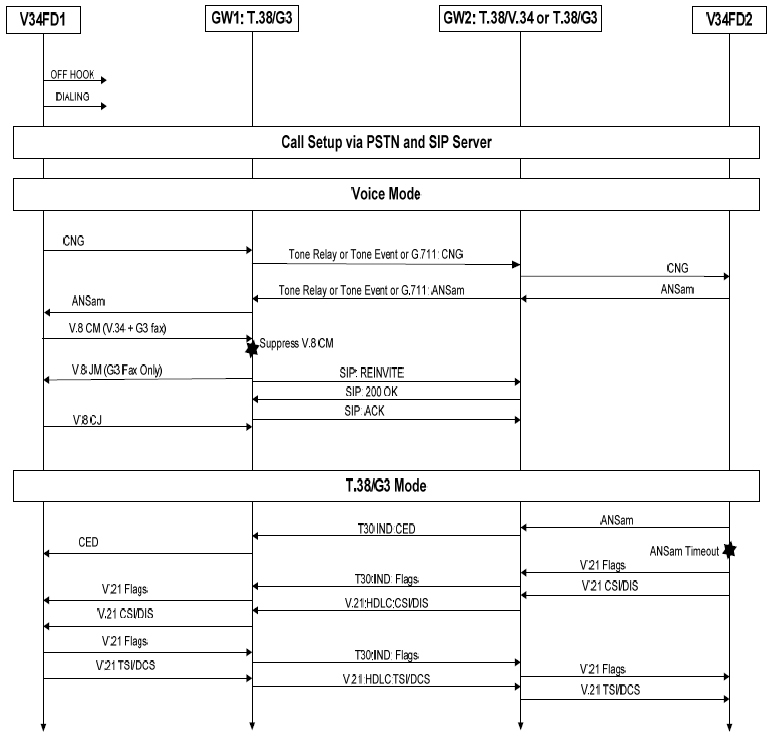 T.38 – Is a protocol that describes how to relay T.30 fax messages over a VoIP network. The relaying of fax is done hop by hop through the data network between VoIP gateway devices. The end fax devices are not aware that this relay process is happening (unless it’s a fax gateway that directly supports T.38), and it uses T.30 protocol directly with the Gateway that is closest to it. The gateway terminates the T.30 protocol and converts the stream into a packetised byte stream that it relays to the next hop gateway over an IP network. The Gateway on the other side receiving the T.38 stream will then convert the messaging back into T.30 protocol and pass it to the end fax machine. CNG Tone: A word that will also come up in this article is “CNG Tone”. CNG tone is basically a tone that the originator of a fax call plays on the line to indicate that it is a fax call, and that it’s ready to start fax handshaking. The CNG signal is simply an 1100 Hz tone that plays for half a second, and then repeats every three seconds. The T.38 protocol works in conjunction with SIP in a two step process. The first step is to set up a voice stream session. The voice stream is used by the originating fax machine to transmit its CNG tone to the far end fax machine. The far end fax machine then responds with an answer signal (ANSam) over the voice stream. It’s at this point that the gateway can recognise that the call is a fax call, and now move into T.38 transmission processing. To do this a re-invite is sent out by the receiving gateway that includes T.38 settings in the SDP, and the gateways agree upon updating the media session to a T.38 image transmission. When the Lync server receives this message it tries to parse the SDP of the Invite before it forwards it back to the Analog Gateway (with the fax machine connected to it). When it parses the message it finds the m field equals image (m=image), which it doesn’t support. This results in an Invalid SDP message being sent back to the far end gateway and the call being torn down. This concludes the sad fact that Lync (2010 and 2013) does not support T.38 protocol negotiation directly with Analog and PSTN Gateways. New-CsAnalogDevice -LineUri tel:+61399991111 -DisplayName "Name of Fax Machine" -RegistrarPool lyncpool.domain.com -AnalogFax $True -Gateway <IP/FQDN> -OU "ou=LyncUsers,dc=domain,dc=com"
So I would expect that the first thing a good IT professional would do when installing a fax machine is turn this setting on, because it’s a fax machine, right? So I definitely should tell the system that it’s a fax machine, right!? Well, not necessarily. As it turns out, this setting is very specific in its operation, and is what, at best, I would describe as a work around solution for fax. Basically, if an analog device is marked as being AnalogFax it invokes a special ‘hairpinning’ routing procedure within Lync when the device makes an outbound call. This procedure basically means that Lync bypasses regular routing rules and sends the invite message straight back to the gateway that sent it. The idea of this is that the analog gateway is supposed to send the call out a PSTN line that is also directly connected to it, and in the process avoids sending the fax media stream over the IP network all together. Note: My gateway didn’t accept the call, and as a result sent a 404 Not Found back to Lync. After this the call fails. So, why don’t you just don’t save the money on the gateway and connect the fax machine directly to the network? The only reason is that if you do this, there will be no CDR records output by Lync for calls made from fax machines. So the question is, how much are CDR records worth to you? If the answer is more than the price of an analog VoIP gateway with FXS and FXO ports, then you’ve come to the right place! What are the options available on Lync for fax? The first option, as I have already described above, is to connect the fax machine directly to the network and bypass Lync altogether. There are two problems with this method: the first is that it requires individual analog/digital carrier services brought into the premises; the second is that there will be no CDR records reporting in Lync for these calls. This is the method that Microsoft officially supports for fax calls. On Technet it is described as “hairpinning”. The way it works is that once you enable the AnalogFax setting within the New/GetCsAnalogDevice command, and enable Media Bypass, calls from this device to external numbers will get sent directly back the device by Lync. This actually bypasses all of the regular routing flow within Lync. Use an analog gateway with FXS, and FXO/ISDN ports. Ensure that calls get routed inbound from SIP to the FXO/ISDN ports. Note that Lync will normalise the number before it's sent back, so you will have to do something with the “+<prefix>” before sending it to the carrier. Enable Media Bypass on Lync. Grant a Voice Policy with appropriate PSTN Usages for the Analog Device. Configure your VoIP gateway to use G.711 for fax. This usually involves disabling T.38 settings. For this scenario the fax stream is sent via G.711 to a local ISDN/Analog gateway and then on to the carrier. This scenario can be achieved as long as you can ensure that there is no network jitter or packet loss issues between the two gateways. 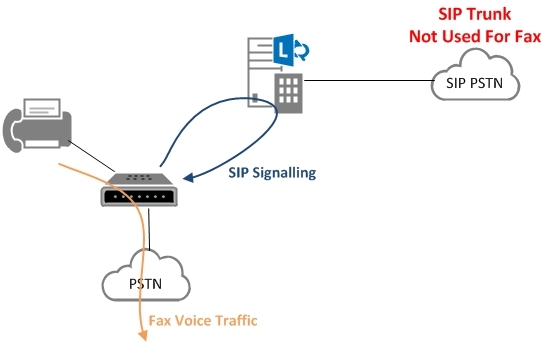 So I would not recommend making fax calls from an Analog gateway across a WAN to the PSTN gateway, as you may not be able to guarantee the quality of the voice stream. Configure your VoIP gateways to use G.711 for fax. This usually involves disabling T.38 settings. This is the most complex scenario on the list, because you have to ensure that internally you are using G.711 between the gateways and externally you are using T.38. Note, this will only work if the Carrier SIP trunk provider supports T.38 protocol. So ensure that you consult with your carrier before attempting this kind of configuration. Configure the fax connected analog gateway to use G.711. This usually involves disabling T.38 settings. On the Lync facing SIP leg of the SBC ensure that fax calls are configured for G.711. This usually involves disabling T.38 settings. 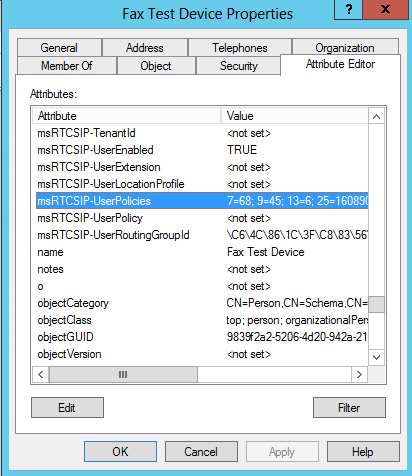 Enable T.38 on the external SIP trunk that faces the SIP Carrier. Open the 'IP Profile Settings' page for the Lync Trunk (Configuration tab > VoIP menu > Coders And Profiles > IP Profile Settings). Open the 'IP Profile Settings' page for the SIP Carrier (Configuration tab > VoIP menu > Coders And Profiles > IP Profile Settings). Note: Voice Routing, as described below, only works when the AnalogFax setting is set to $false. Note: Above there is no VoicePolicy assigned to this user. This will result in external calls failing. So now your Analog Device has a Voice Policy, which is great for allowing it to dial out. What if a user was to dial an un-normalised number from an Analog Station though, will it get normalised? Well, this is where things get interesting… The short answer is that it will get Normalised, however, which normalisation rules are used is the bigger issue. ms-diagnostics: 14011;reason="Called Number translated";source="2013ENTFE001.DOMAIN.COM";RuleName="Keep All";CalledNumber="0407555999";TranslatedNumber="+0407555999";appName="TranslationService"
Note: the TranslatedNumber is different in both cases, the first case used my Melbourne Site dial plan and the second used my Global dial plan. So now you might be wondering what happens if you force a User Policy onto the Analog Device. Well, here’s what happens. The moral of this long winded story is that you must set a Voice Policy for the Analog Device. 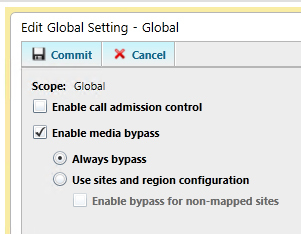 When it comes to Dial Plan normalisation you have two choices, either normalise the number on the gateway (using translation rules of the gateway) before sending it to Lync, or use the Global or Site based default rules to normalise the number once it reaches Lync. Note: There are some other special requirements that the gateway has to support here. If you are not using CAC then you can select “Always Bypass” as the option. In this configuration, both client and trunk subnets are mapped to one and only one bypass ID, which is computed by the system. If you enable CAC, you cannot select Always Bypass, and vice-versa, because the two configurations are mutually exclusive. That is, only one of the two will apply to any given PSTN call. First, a check is made to determine if media bypass applies to the call. If it does, then CAC is not used. This makes sense, because if a call is eligible for bypass, it is by definition using a connection where CAC is not needed. If bypass cannot be applied to the call (that is, if the client’s and gateway’s bypass IDs do not match), then CAC is applied to the call. - CAC not enabled and Media Bypass set to Use Site and Region Information. Where Use Site and Region Information is enabled, bypass determination works essentially the same way, regardless of whether CAC is enabled or not. That is, for any given PSTN call, the client’s subnet is mapped to a particular site, and the bypass ID for that subnet is extracted. Similarly, the gateway’s subnet is mapped to a particular site, and the bypass ID for that subnet is extracted. Only if the two bypass IDs are identical will bypass happen for the call. If they are not identical, media bypass will not occur. Even though CAC is disabled globally, bandwidth policy needs to be defined for each site and link if you want to use site-and-region configuration to control the bypass decision. The actual value of the bandwidth constraint or its modality doesn’t matter. The ultimate goal is to have the system automatically calculate different bypass IDs to associate with different locales that are not well connected. Defining a bandwidth constraint by definition means a link is not well connected. Faxes don’t like jitter that is caused from variable delays in packetised voice networks. So some gateways will actively try and reduce the amount of jitter by increasing the Jitter Buffers (perhaps to 100ms) for calls that they detect as being fax calls. What this does is reduce the chance of Jitter affecting the media stream, by increasing the overall end to end latency on the call. 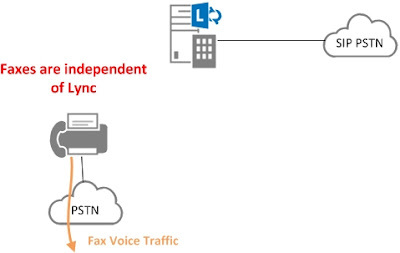 This trade off works because fax was built to handle fixed latency caused in long distance PSTN calling scenarios back in the good old days of TDM voice networks. This functionality does not usually have explicit settings in a VoIP gateway. However, if there is a fax setting that allows you to choose G.711 (passthrough), then it can often be a built in function of this setting. Ensure that you turn off Silence Suppression (Voice Activity Detection) on all hops. Silence Suppression means that when the gateway detects that audio is under a certain threshold on the call, in an effort to save bandwidth, it will stop sending RTP on the link. For voice calls, this is fine, but for fax calls this is not a good idea. Note: this is called different things on different gateways. The other most common name is Voice Activity Detection (VAD). Note on AudioCodes: On AudioCodes Media Pack gateways, I’ve had issues with the silence suppression not working. By this I mean that Voice Activity Detection is still being enforced, and the RTP stream is being suppressed during breaks in fax tone. This unfortunately doesn’t mix well with fax. When you have “No Fax” set in combination with this setting (with the Silence Suppression bug), the fax tones get treated the same as voice. If you set “G.711 Transport” as the Fax Signalling Method this bug gets bypassed. When you are using a G.711 codec, ensure that you test your volume levels. In Australia we have a great service offered by Telstra called “FaxStream” (1300368999) that allows you to send a fax to it, and get sent back a return fax that details if the audio levels on the call were acceptable or not. Based on the response on some gateways you can tweak the Tx and Rx levels of the voice stream. An example is on Quintum gateways: this is set under the IP Routing Groups->Advanced Tab. Ensure that configuration on the Analog Gateways that the fax machine is connected to, the PSTN Gateway, the SBC, and the carrier SIP network are all correct. Each hop matters as much as the others, so don't fall into the trap of assuming it's one specific device that's the problem without first checking them all.